Today I’m going to share some tips about trading with someone in person. My guide to trading online is coming soon. These are little things, mostly, but when you’re pleasant, it makes the whole process easier. First of all, when you’re trading, it helps have a goal in mind, even if that goal is to find some cards that might be sweet in EDH decks. I like to have a list when I’m trading, so I know if someone has a card I need to look for and target. I’m all for browsing random binders for awesome cards, but a little organization goes a long way. Do the same thing for the other person. Ask what they are looking for, to know if you have things that they are looking for. If you have one or two of the things they want, then you’re off to a great start. Speaking of organization, I have to put this out there: If there’s a card you don’t want to trade, put it in the back of your binder, flip it upside down, do something to indicate to me that it’s not readily available. I have a French-language Delay in my binder and it’s a real treat to see reactions to a card titled “Retard.” I won’t trade it, though, and I feel bad when they ask. Everyone’s allowed an exception or two, for the cards they are emotionally attached to. When it’s a lot of your binder, then it’s less forgivable. During the process, I like to ask if I can take cards that I am interested in out of the binder. First of all, it’s polite, because I’ve had guys start taking out lots of cards from my pages until there’s a stack. You want everyone to be comfortable with what’s going on, so stay courteous. A key point in trading is that you’re always free to walk away if the other person is being belligerent, condescending, or unpleasant. I don’t regret leaving a good trade behind if someone else is being a jerk. If you’re being pushy to get a certain card, I hope it’s because you’re excited. If you’re playing hardball in trades, you turn people away. I have spent an hour getting a trade right, because there was a Russian foil Doubling Season from Ravnica involved, and I HAD TO HAVE THAT CARD. I can’t speak for everyone, but when I hear the phrase, “What do you value this at?” I immediately want to stop the transaction. I’ve never had that said where someone wasn’t trying to exploit a knowledge gap of some kind. It immediately makes me want to pull out my phone and check on the price right away, and this is one of the major issues with trading in person. If I have a card in my binder that someone wants, and they ask, “How much do you want for it?” I feel a lot less anxiety, even though that’s a very similar question. On that note, if you do check prices on a phone, make sure you’re both using the same site. Why not take advantage of our site? Keep your collection organized here and have price data instantly available. I believe it’s the word ‘value’ that has taken on a great deal of negative connotations. 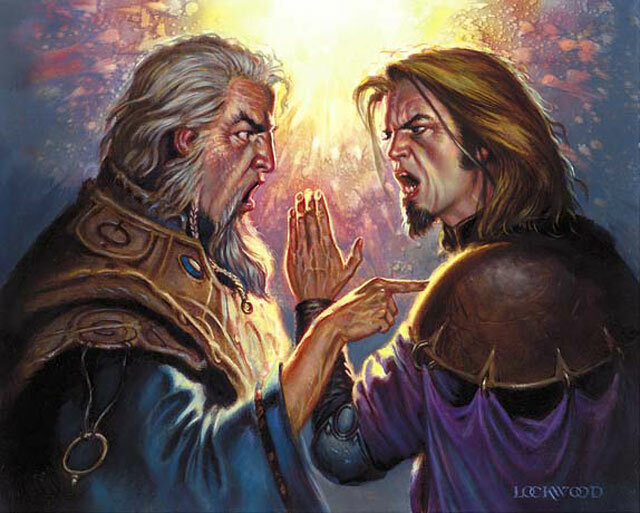 There are articles all over the place about how to ‘get maximum value’ on a trade, and the only context I can accept that in is when you’re trading in-print Standard cards for older, long-out-of-print cards. I don’t mind giving more than retail value in such a trade. For example: In April, I had a set of Bonfire of the Damned for trade and someone offered me to trade those four cards and a pair of Overgrown Tomb for a Revised-edition Badlands I badly wanted. At the time, Badlands was around $60, and I would be giving around $85 worth to him for it. That’s about a 30% markup for a dual land, and it’s a trade I made. Now, four months later, it looks like I ripped the guy off, since Badlands is at $70 and I gave him $60 worth of cards. However high you think a card will go, though, you have to trade based on what it’s worth at this moment. Perhaps you’ll be right and it’ll hit $20. Perhaps it’ll go low again, then balloon in a year. 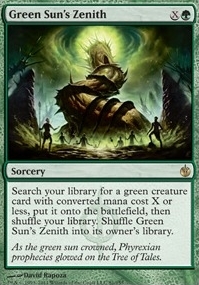 Perhaps you’ll get surprised like I was with Green Sun’s Zenith, a card I felt was amazing in older formats and picked up from people for around $10…and then it got banned in Modern for being too good, causing the price to drop down again. It’ll be in FTV: 20, too, and that will push the price down even further.